In case you weren't aware, Disney is releasing a live-action version of The Jungle Book this April 15th. I think most everyone who grew up watching the 1967 animated film or read the original book by Rudyard Kipling is totally stoked. I'm interested to see in what direction they take the film. Purportedly, it's a remake of the animated film, not an adaptation of the book (if you catch the difference). I'm excited to see it either way. (1) Jon Favreau is directing. That's right, the director of the much-beloved Christmas classic Elf is at the helm. He's also the one who directed both Iron Man films, Cowboys & Aliens, and oh yeah, he was Monica's short-term ultimate-fighter-wannabe/billionaire-boyfriend on Friends. (2) It's a great story. 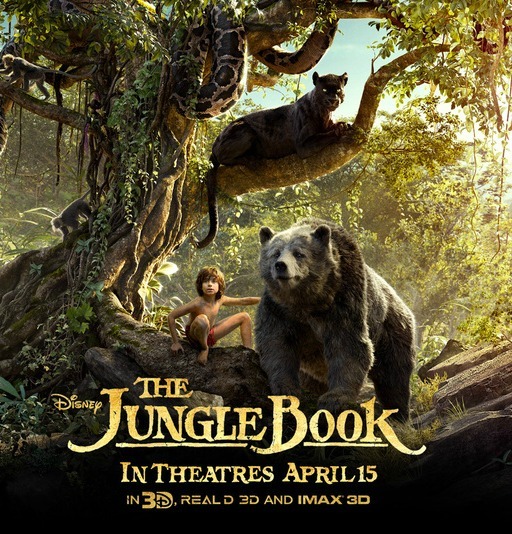 In Rudyard Kipling's 1894 children's books The Jungle Book and The Second Jungle Book, Mowgli is a young boy who has been raised by animals within the Indian jungle. The moral tales feature characters both good and evil: Baloo (bear), Bagheera (panther), Shere Khan (tiger), Kaa (python), Rikki-Tikki (mongoose), plus monkeys, wolves, bears, elephants, cobras, you name it. (3) It has an amazing cast. (4) Bill Murray, Bill Murray, Bill Murray! Yep, Bill Murray is the voice of Baloo. And the heavens rejoiced. (5) The trailer will be shown during the Super Bowl. If Disney's willing to shell out mucho dinero to feature the film during the most expensive commercial timeslot of the year, they're betting on it being a winner.